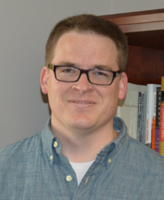 Aaron Willis, a Ph.D. candidate in Notre Dame’s Department of History, has been named the 2013-2014 Murphy Irish Exchange Fellow. In its second year, the Exchange Fellowship was established to promote research in Irish Studies through a greater understanding between graduate students at Notre Dame and the University College Cork (UCC) in Cork, Ireland. In alternating years, a graduate student from each institution will be fully integrated into the academic life and social cultures of each institution. Willis, who is currently working on his dissertation titled “The Constitution of a Pragmatic Empire: The British Atlantic Toleration and the Quebec Act, 1763-1776,” is thrilled to have the opportunity to study at UCC. Willis received his B.S. in political science from Santa Clara University and an M.A. in history from Texas A&M University. At Notre Dame, he has received numerous honors and awards, including Keough-Naughton Travel Grants for Language Study, Nanovic Research and Travel Grants, Zahm Research Grants, and the Institute for Scholarship in the Liberal Arts Graduate Student Research Award. All have permitted Willis to travel and research in Ireland to further his studies. He has served as the graduate assistant to both the director of undergraduate studies and the Irish studies librarian (2012-2013), as well as chairing the conference committee “From the Glorious Revolution to the E.U. : Connections Between Britain, Ireland, and the Continent,” in the Graduate Student Conference at Notre Dame, March 9-10, 2012. Willis also has numerous teaching experiences which he will bring to UCC, including a course he developed and taught in Spring 2012 titled Empires of the Atlantic World: Contact to Revolution. The Murphy Irish Exchange Fellowship is funded by a grant from Notre Dame’s Keough-Naughton Institute for Irish Studies and is administered by Institute Director Christopher Fox. The fellowship is open to graduate students in the field of Irish studies. Fellows receive a stipend of $12,000, round trip air fares and tuition waivers. Marie-Luise Theuerkauf, a Ph.D. student in the Departments of French and Early & Medieval Irish at UCC, was the first Murphy Irish Exchange Fellow. Originally published by Margaret Lloyd at al.nd.edu on May 14, 2013.